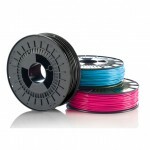 In mid July or beginning of August of this year, depending on the speed at which the Ultimaker2 and aprox. 20kg of fillaments (yes 20kg :D) materials of various colours will be delivered, I will embark on a whole new path of modeling, slicing, printing, post-work and enjoying the new revolution – that is 3D printing. After extensive research of the 3D printer consumer market, I came to realize that within the budget available, Ultimaker2 is the optimal choice between three companies that made it to the top 3 tier. Makerbot (a US based company, Brooklyn – NYC), Ultimaker2 (a EU based company, the Netherlands) and Zortrax (a EU based company, Poland). 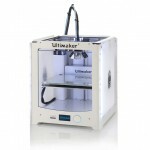 One being overpriced and on another continent, the other being promising but with a community far too small and with a big load on their backs (a 5000 printer big deal with Dell) and a slightly less responsive support, the clear choice at the end was Ultimaker with its 2nd generation “Ultimaker 2”. An open source system both software and hardware-wise (to some extent) it leaves much room for maneuverability for use of 3rd party fillaments, multiple types of materials and upgrades (like dual extrusion system) in the future. Also not being tied to one slicer programme gives proven hope for a better possibility of actually printing up to 20 microns of layer resolution as opposed to Ultimakers competition. So the only thing remaining now, is to wait for the package of the printer + over 20kgs of fillament package, with its “scary” 8 – 10 weeks lead time to arrive (hopefully unharmed – this message is for you DHL people and the likes :P) to our doorstep and we will be off to a world of 3D printing. The “What” and “Where” remains a secret for now, by request from my associates in this 3D printing project. Be on the look out for more info, news and 3D print results right here on my website.